U.S. Senator Jeff Merkley is back at the Mexican-American border. The Oregon Democrat and rumored presidential candidate decried the "unconscionable" conditions at migrant detention camps during a two-day trip to la frontera on Friday and Saturday, Dec. 14 and Dec. 15. "We can't look away. Now more than ever, we need to shine a light on what is happening at our border," he said. Merkley was joined by Democratic Sens. Mazie Hirono of Hawaii, Tina Smith of Minnesota and Congresswoman Judy Chu of California. Rep. Beto O'Rourke — a Texas Democrat and another contender with possible presidential ambitions — met the delegation on Saturday. The politicians toured the Family Residential Center in Dilley, Texas, and the Karnes Family Residential Center in Kansas City, Texas, both of which are operated by U.S. Immigration and Customs Enforcement. 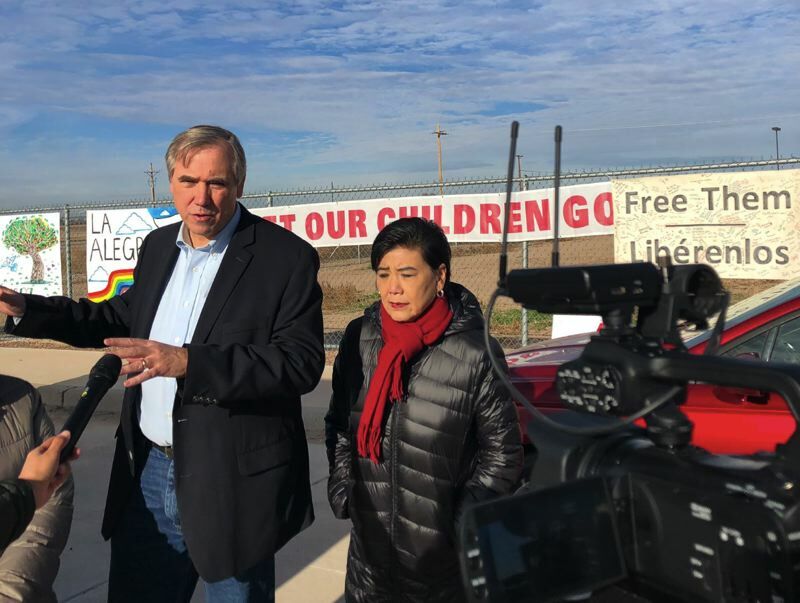 At a later protest in Tornillo, Texas, Merkley said the delegation was not allowed to speak with children at the town's temporary minor migrant detention facility, which Merkley referred to as a "child prison" and a "tent city." The roughly 2,000 children held at Tornillo live in fabric structures that have air conditioning and offer some other amenities, but no outdoor shade. "These temporary structures are intended for emergencies like hurricanes and natural disasters. It's costing taxpayers almost $1 million per day!" Merkley wrote on Twitter. The 62-year-old made headlines after police were called during his Father's Day trip to the border in June. Merkley attempted to change an Oregon law that requires him to give up his U.S. Senate seat in order to run for president, but now seems to have conceded that Salem lawmakers won't be rewriting the rulebook any time soon. "It doesn't appear that there is a consensus to make this move at this time and I'm completely fine with that. Our leaders in Salem have plenty of important issues to build consensus around," he said Dec. 7. A very crowded field is expected to vie for the Democratic Party nomination in 2020.